It’s been a busy few weeks—or rather few months. Sister’s and families from Israel and Canada visiting, the adoption of Ginger (AKA Vi), two students who have defended their dissertations and graduated over the past 4 weeks, and a ****load of other work-related issues. Ginger asleep on my stomach. 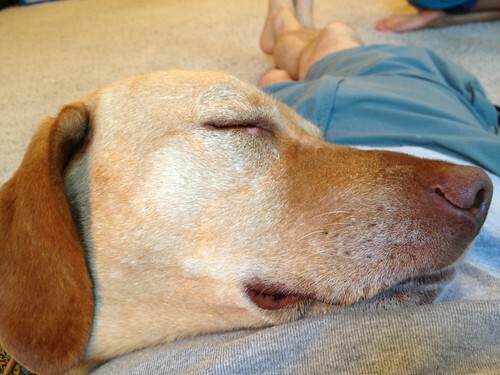 As it turns out, being a dog in the US is generally a guarantee of the good life. Statistics online show that ~36% of households in the US (more than 1/3) have at least one dog, with about 70,000,000 dogs in the US. That’s a huge number—indeed it’s mind-boggling to me. I had never noticed before the huge sections of grocery store shelves allocated to pet food and apparatus. Or the tremendous variety of types of dog food. Chicken-flavored, lamb-flavored, venison-flavored and so on. Dozens is an understatement. There are easily over a hundred at the local pet store. No wheat. No gluten. No filler. Protein this and protein that. 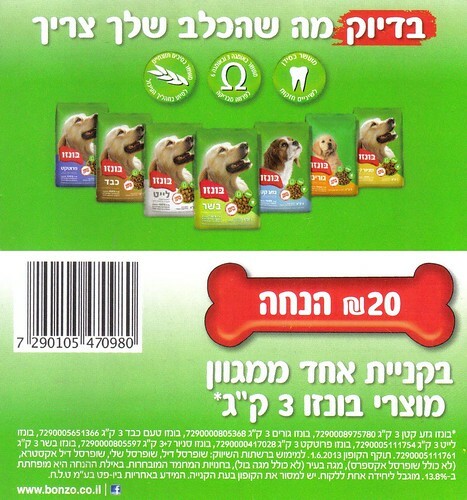 When I had a dog in Israel, there were 2 types of dog food: Dogli and Bonzo. My dog didn’t like Dogli, which I can’t find on the web—so perhaps they’ve gone bankrupt. Bonzo was liked, and I was abl;e to track down a coupon for Bonzo, so it’s still around. But here in the US, dogs are big business indeed. All through my habitation in Israel, the US was widely admired for its ingenuity. People would talk about “how things are done in America.” Something of high quality or something well organized was done “the American way” or “using the American system.” Obviously this is idolization. But even today, my sisters-in-law from Israel are still absolutely impressed by the order and organization in US society, and overall how generous people are in their interactions with one another. I do agree with this, especially here in the Midwest. Sure enough a cute little bone-shaped dog biscuit arrived a few seconds later and Ginger, needless to say, was thrilled. I think that she will be happy to return with me to the bank next time. What can I say? America! 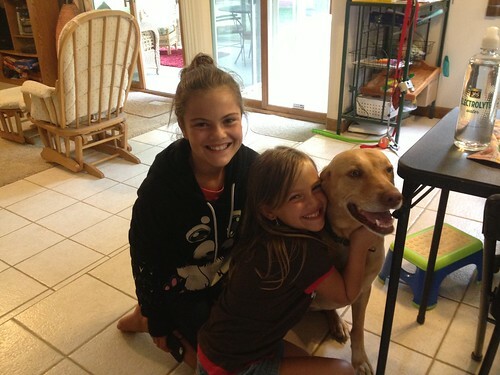 This entry was posted in humor, Uncategorized and tagged America, bank, dog, dogs, summer, US, velcro, vizsla. Bookmark the permalink. Heidi the Dog is currently on a special diet to help her lose weight and improve the muscle tone around her arthritic hips. The diet cost more than £70 for a 12kg bag. Big biznis indeed. I have considered having my salary wired directly to our veterinarian. Ouch for the arthritis. Double-ouch for the cost of the food! Remind me not to read OT comments when on lunch break. Hey, you have a dog now. Dogs are disgusting. Get used to it.